სონა აბგარიანმა წარადგინა იმ ხელოვანთა რამდენიმე ვიდეო ნამუშევარი, რომელთაც აქვთ სხვადასხვა პროფესიები და წარსულში შეხება არ ჰქონიათ ხელოვნებასთან. ასევე, მან წარადგინა ახალგაზრდა ხელოვანთა ნამუშევრები და განიხილა პოლიტიკური სიტუაციის ზეგავლენა თანამედროვე ხელოვნებაზე. Sona Abgaryan presented video works of few artists, who have different professions and who in the past did not have any relationship to arts. She also presented the works of emerging artists and later discussed the impact of political situation on contemporary art. სონა აბგარიანი დაიბადა 1979 წელს, ბერდში, სომხეთი. მისი ნამუშევარი პირველად 1998 წელს დილიჟანში, მხატვართა კურორტზე გამართულ ხელოვანთა კონგრესზე გამოიფინა. ეს იყო ინსტალაცია, შესაძლოა პერფორმანსიც. მან ხეზე ჩამოკიდა კონვერტები, რომლებშიც განთავსებული იყო მესიჯი: „უშველე საკუთარ თავს“. ამას მოჰყვა მისი სხვა გამოფენა - „სხეულისა და სულის სიგიჟეები“. 2001 წელს, რამდენიმე გოგონასთან ერთად, სონამ ჩამოაყალიბა როკ ჯგუფი და იყო ყველა სიმღერის ტექსტებისა და ჯგუფის დასახელების ავტორი. თუმცა, 2 წელიწადში ჯგუფი დაიშალა. სომხეთის რეალობაში გოგონათა ჯგუფი ექსტრაორდინალურ ფენომენს წარმოადგენდა და აღშფოთებას იწვევდა. იგივე გუნდთან ერთად მან დაიწყო სატელევიზიო გადაცემა "Underground", თუმცა ამ პროექტის არსებობაც ხანმოკლე აღმოჩნდა. ის გადაიცა მხოლოდ ორჯერ და შემდეგ გაუქმდა, რამდენადაც კომერციულად მომგებიანი არ იყო. გადაცემა შეეხებოდა გოგონათა ჯგუფს, რომელიც უარყოფდა რეალობას და სურდა მიწისქვეშ ცხოვრება. ეს შოუ ნაჩვენები იქნა 2001 წელს ვენაში, საზაფხულო ხელოვნების ფესტივალზე “The world is you". 2007 წელს მან დაიწყო სკოლაში მუშაობა, სადაც უძღვებოდა ფილმისა და ფოტოგრაფიის დეპარტამენს. 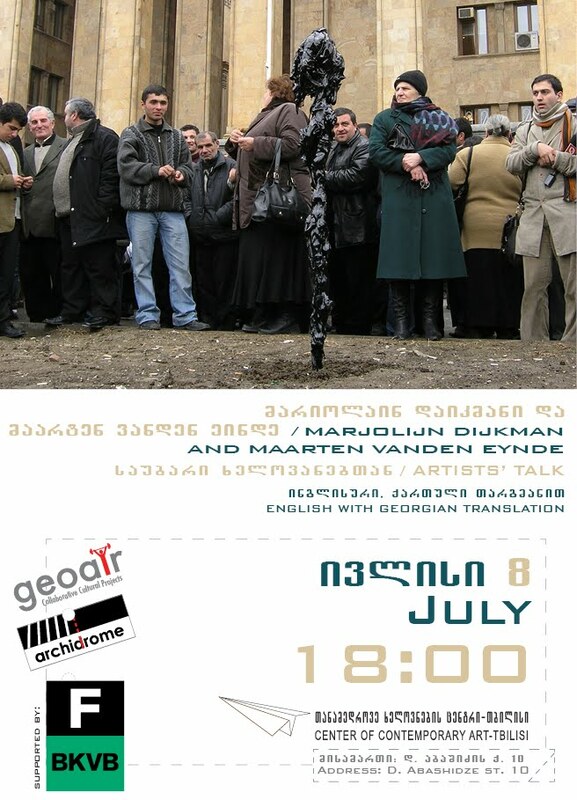 2009 წელს, ხელოვანთა ჯგუფთან ერთად, სონამ დაიწყო ყოველწლიური ალტერნატიული მედიის ფესტივალი "Rusty Pumpkin". ამ ინიციატივის იდეა წარმოადგენდა ახალი, ალტერნატიული პლატფორმის დაწყებას, სადაც სხვადასხვა ასაკისა და პროფესიის ადამიანებს შეეძლებოდათ ფილმებისა და ვიდეოების მიწოდება, რომლებიც შეზღუდული არ იქნებოდა ნარატიული, ფორმის, სიგრძისა და პროფესიული ასპექტებით. 2012 წლიდან სონა მუშაობს ერევანში თანამედროვე ექსპერიმენტული ხელოვნების ცენტრში და ხელმძღვანელობს ხელოვნების დეპარტამენტს. გამოფენაში "Crisis" მან წარადგინა მისი ბოლო დროის ვიდეო “About," და პროექტი "The Anthem of the Crisis", რომელიც სვეტლანა ანტონიანის ფოტო ისტორიას აჩვენებდა. „ჩემი ნამუშევრების თემა ყოველთვის განსხვავდებოდა სახელოვნებო ცხოვრების სხვადასხვა ეტაპებზე, თუმცა, ერთი ელემენტი ყოველთვის დომინირებდა ჩემს საქმიანობაში - თამაშის ელემენტი. ჩემთვის ხელოვნება თამაშია, რომელსაც ზოგჯერ არ აქვს ბედნიერი დასასრული. ამჟამად, ეს ჩემთვის ზღაპარივითაა, რომელსაც ფსიქოლოგიური, სოციალური და პოლიტიკური ნარატივები გააჩნია“. 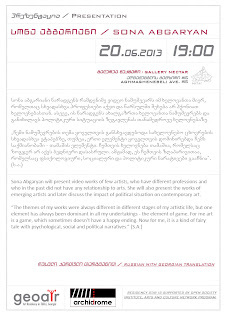 Sona Abgaryan was born in 1979, in the city of Berd, Armenia. Her work was first exhibited in 1998, during the Artists Congress at the Painter’s Resort House in Dilijan. It was an installation, or perhaps a performance. 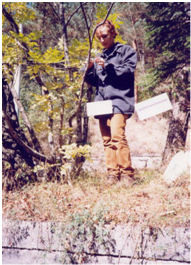 She had hang envelopes from the trees with the same message inside, “Save yourself.” It was followed by other exhibition by her called: “The Crazies of Body and Soul”. In 2001, with few girls Sona formed a rock band and was the author of all the lyrics as well as of the name for the band. In two years they split off. In Armenian reality a 'girl band' as such was an extraordinary phenomenon, and it had generated a lot of anger. With the same team, they had started a TV show, "Underground," but it again had a short life. It was broadcasted only twice and then was pulled off the air since it wasn't commercially viable. The show was about a group of girls rejecting the reality and wanting to live in underground. This show was also presented in “The world is you" Summer Art Festival, Vienna, Austria in 2001. In 2007, she started to work at a school where she was in charge of the Film and Photo department. In 2009, together with a group of artists, Sona initiated "Rusty Pumpkin" Annual Alternative Media Festival. The idea was to launch a new, alternative platform where people from different age groups and with different professional background could submit their films and videos regardless of the narrative, form, length and the professional quality. 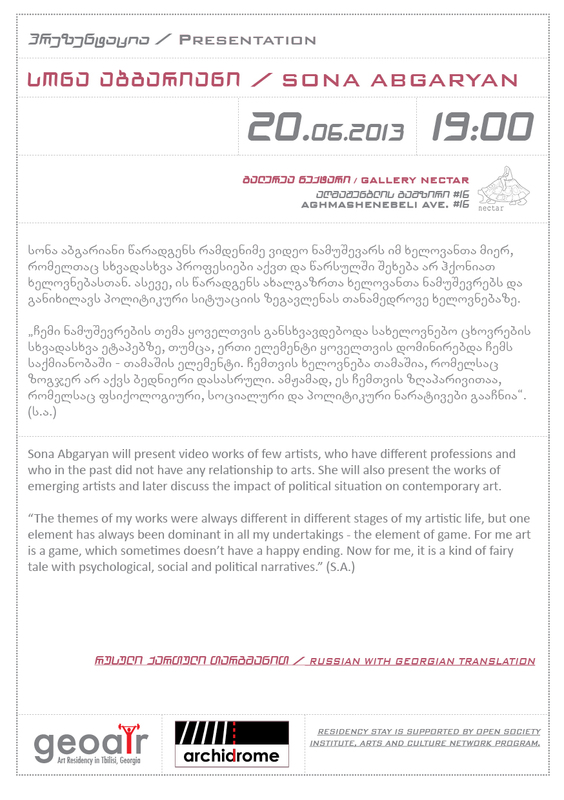 Since 2012, Sona works at the Contemporary Experimental Arts Center in Yerevan and is in charge of the Art Department. In exhibition called "Crisis", she presented her recent video, "About," and "The Anthem of the Crisis" project, which illustrated Svetlana Antonyan's photo story.